J Francis Carpets Tel: 07850 196 093 Carpet Fitters – Best price for twist pile, pattern carpets, plain carpets, wool carpets and carpet fitting in Romford. All Natural, No Faux Sisal Carpet, Flooring, Twist Pile, Pattern Carpets, Plain Carpets, Wool Carpets, Laminate Flooring, Carpet Tiles. A free measuring service in Romford and surrounding areas. Free no obligation quote Professional Fitting Service Best Prices Around Contract Flooring Entrance Matting Selection of Carpets and Carpet Tiles. 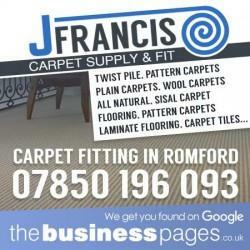 Pubs, Nursing Homes, Restaurants, Houses, Flats, Contract Carpet Fitting in Romford and surrounding areas.